Saddle Up is open daily for trail rides. 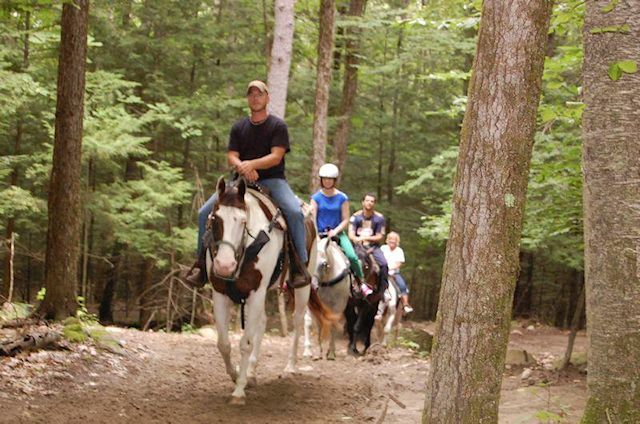 Saddle Up Stables offers a trail ride with lake views that take about an hour to complete. If you plan on bringing a large group, we ask you call or email in advance to plan your event. Rides are offered continuously throughout the day (approximately every 10 to 15 minutes) We try our best to get you out in the order you arrive. Sometimes we have to accommodate different groups as horses are available, such as horses for children or adults) Please try to understand this and respect our decisions. No dress code is enforced, however long pants and closed toe shoes are strongly recommended. Your legs can rub on the saddles, so please dress accordingly. Helmets are required for anyone under age 18. We provide riding helmets free of charge. No carry on items are allowed to be taken with you on the horse. So please be prepared to leave your items at the stable office or your car. This includes, carry on bags, purses, backpacks, water bottles, etc. These items can not only be a distraction, but also any loud noise could frighten your horse and these items could be dropped making it unsafe. We will be happy to take your picture using your phone or camera when you return from the ride. DO NOT USE YOUR CELL PHONE WHILE RIDING A HORSE. *For your own safety, you should not carry anything with you while riding a horse. Your full attention must be on riding your horse at all times. The trail is out in the forest where there are deer and other wild animals occasionally, so you need to be alert at all times while riding. We are more than happy to take your photo or group photo for you. Please plan on leaving your camera or phone with us at the desk.